Last year (really like, a month ago) Lauren and I were sitting around my apartment with our friend Yanina when Lauren announced, "I think next year I'm going to start dressing in specific themes." Yanina and I looked at each other and said, "So, you're going to start wearing costumes now?" Looking exasperated Lauren explained that in her mind everything she put on was thrown together haphazardly and moving forward she wanted to get dressed with specific "themes" in mind -- nautical, boho, you name it. The point is, whether she realizes it or not, her style is anything but haphazard and I love this look for exactly that. I also love those pants, which I plan on borrowing. Immediately. wow this look is really gorgous darling! i don´t know what i love most your fabulous hat, shirt or your hot leather pants! I always try to dress in themes or try to tell some kind of story through my clothes. I think dressing up should be fun. And this look is TOTALLY fun. 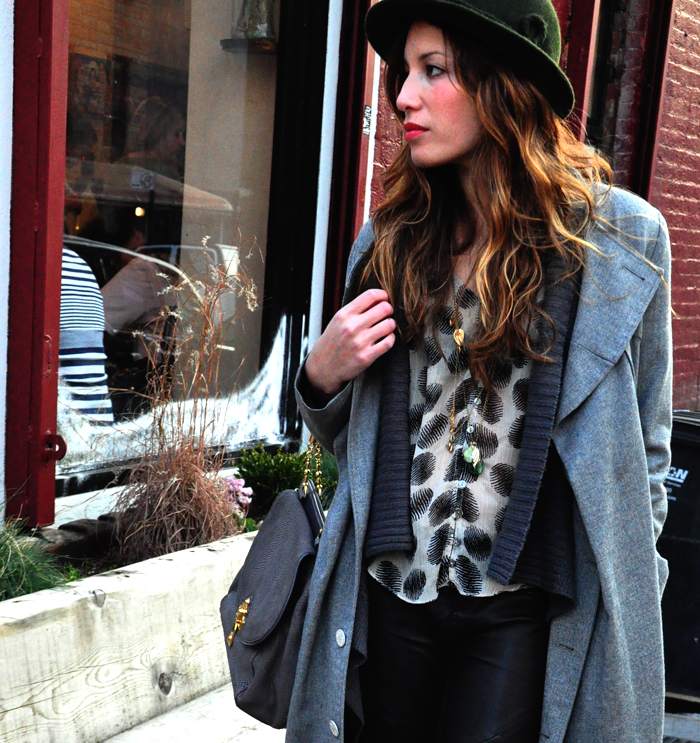 Love the hat, the coat and the leather pants! Yes I say..........yes..Boho please - lets really bring Bohemian back! I will join you too! Thanks for stopping by my blog! good luck to 2012! I love this! Beautiful from head to toe. Lovely photos! You look great with it. The hat added a nice touch to your look. Beautiful! Great look! I love all the grey. nice ! love the coat ! gorgeous look! love your hair! I LOVE the mixed long pendant necklaces! Lovely. Loving your style and photographs ! Gots to follow you on BL too :) Thanks for stopping by ! Hello there girls! Thanks for the lovely comment over my blog, it means a lot to me! Also for finding me so I could see your awesome blog! I totally love it! Great style, outfits, pics, everything! I'm following you now via GFC and Bloglovin'! If you want to check me on your followers list I'll be in the end because my profile picture doesn't appear! Do the same if you like my blog! Come and visit my cooking blog 2 and If you like it you can follow me there, but I can't follow you twice because I have both blogs with the same add! Love it....LOVE THE WHOLE LOOK! Gorgeous look ! :> Thanks so much for your comment, so I could find your blog. I'm following via Bloglovin'. I hope to see you back at my blog someday, it would be fun to follow each other. You have such great style!.. Took some time to look around and you have really cool stuff on here so adding you to my google..maybe follow each other?